Mel Bochner is a Contemporary Artist who was born in Pittsburgh, PA in 1940. Mel Bochner studied fine art at Carnegie Institute of Technology in Pittsburgh, receiving a Bachelor of Fine Art in 1962. After graduating, Mel Bochner traveled to San Francisco, before settling in New York City in 1964. During the late 1960s, like other conceptual artists, Bochner turned away from self-expression, choosing instead to explore organized systems of thought, such as language and mathematics. Bochner created art drawings in galleries that followed specific systems based on circular forms and on the measurements of the gallery space. For his Measurement series, Bochner used black tape and Letraset to create line drawings accompanied by measurements directly on to walls, effectively making large-scale diagrams of the rooms in which they were installed. Mel Bochner also used sculptural pieces to explore the basic properties of measurement, weight, and gravity. Our Fine Art Gallery has the finest quality Mel Bochner original prints, monoprints, and silkscreens. A large inventory is available on and off-site. We encourage you to make an appointment to see specific works you are looking to collect. We are happy to meet you at either our art gallery showroom or at your home or office for a private presentation. Contemporary Artist Mel Bochner was born in Pittsburgh, PA in 1940. Mel Bochner studied fine art at Carnegie Institute of Technology in Pittsburgh, receiving a Bachelor of Fine Art in 1962. After graduating, he traveled to San Francisco, before settling in New York City in 1964. While in New York City, Mel Bochner joined artists Sol Lewitt, Eva Hesse, and Robert Smithson to bring the art world to a post-Minimalist sensibility through both writings and works of art: Paintings, Drawings, and Conceptual Art. In 1966 Bochner had his first art exhibition, held at the Visual Art Gallery, School of Visual Arts in New York. The art exhibition was titled Working Drawings and Other Visible Things on Paper Not Necessarily Meant To Be Viewed as Art, and has been described as the first Conceptual Art Exhibition. During the late 1960s, Mel Bochner, like other conceptual artists, turned away from self-expression, choosing instead to explore organized systems of thought, such as language and mathematics. Mel Bochner created art drawings in galleries that followed specific systems based on circular forms and on the measurements of the gallery space. For Mel Bochner’s Measurement series, Bochner used black tape and Letraset to create line drawings accompanied by measurements directly on to walls, effectively making large-scale diagrams of the rooms in which they were installed. Mel Bochner also used sculptural pieces to explore the basic properties of measurement, weight, and gravity. During the 1970 and 80s Mel Bochner continued to make a series of installation line drawings, but from 1983 Mel Bochner made paintings and prints. 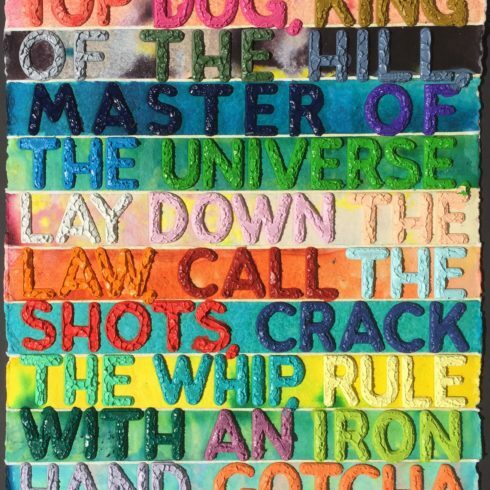 Mel Bochner’s paintings and prints range from extremely colorful works containing words and phrases, to works more clearly connected to the conceptual art he pioneered. 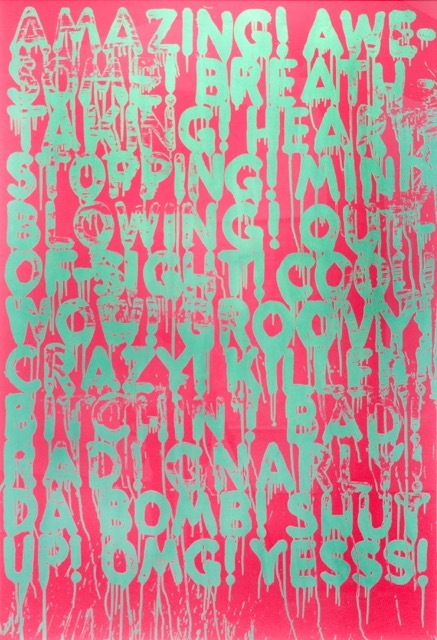 Printmaking has remained an essential medium of experimentation for Mel Bochner particularly his unique Monotypes. Created on hand-made paper, Bochner explores the conventions, codes, and grammars we routinely use – particularly through language. 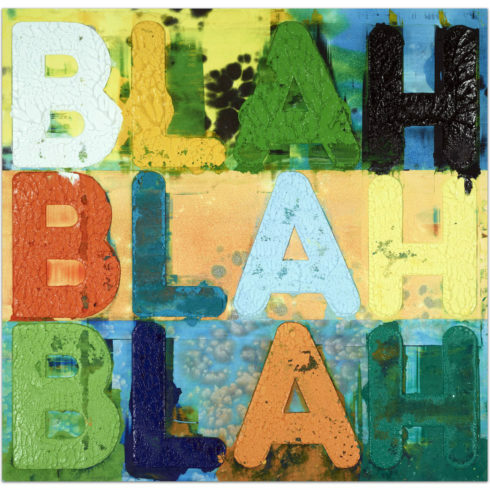 Mel Bochner is most well-known for his monotypes of “Blah Blah Blah” with thick lettering and brilliant colors of paint. 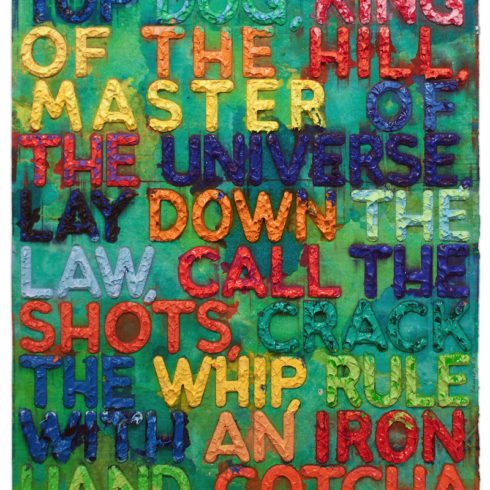 In 2005 Mel Bochner received an honorary doctor of Fine Arts degree from Carnegie Mellon University. Mel Bochner has also taught at the School of Visual Arts in New York, and Bochner was appointed to the Yale faculty in 1979 as senior critic in painting / printmaking. 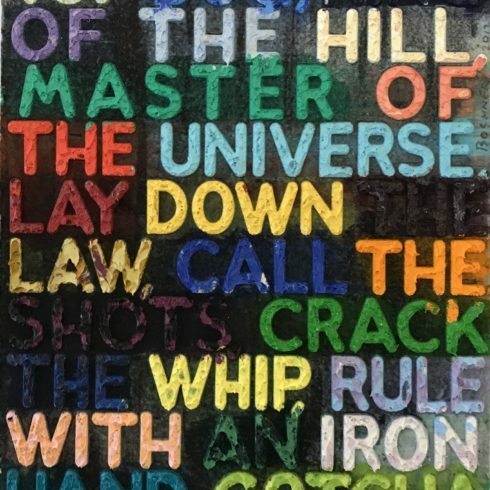 Mel Bochner has exhibited widely in the United States and Europe, and Bochner’s art is represented in both private and museum collections around the world. Mel Bochner still lives and works in New York City.